Yesterday would have been Magnus’s 37th birthday. It’s not a particularly important number, but he would have found a way to make it fun because celebrations of any kind were the man’s forte. He thrived amongst friends and needed virtually no excuse to make an evening memorable. He would have found a way to drag all of his married, bechildrened peers to Manhattan to celebrate (Would he still have lived in Manhattan? Would he have been married? A Dad? These questions are maddening). His friends would have grumbled, then drank, then had fun, then made memories that would become stories to tell years later. In a few short months we’ll mark the 5-year anniversary of Magnus’s passing. This seems ludicrous to me. Magnus has been gone for FIVE YEARS?!?! How is that possible? Osama bin Laden was still alive then! Wall Street hadn’t been occupied! Harry Potter was still in the midst of his interminable theatrical run! Magnus has missed so much…and we’ve missed him so much. A few weeks back, I saw pictures from the wedding of one of Magnus’s best friends. I guess we technically all thought of Magnus as one of our best friends, but this particular guy would have been in the running for #1 on that list. Seeing the pictures without Magnus in them was jarring. His absence was palpable. My only consolation was in pretending that Magnus was the one taking the pictures…that’s basically the only way it made sense. That all sounds like something I should say, except…it’s not true. I didn’t feel that way at all when I saw the wedding photos. Five years is a long time. And in that period, Magnus’s absence at various events is now just a given. At reunions and weddings and beer summits, I no longer think how strange it is that he’s not there. We (his faithful friends) have rebuilt our worlds without him in it. His memory is still there. The stories are still told. We can’t get together without bringing him up often. But, the “missing” is gone…at least in the sense that he’s “missing” from our lives. Expectations have changed. Our worldview has shifted. Magnus is gone…not forgotten…but gone. This is time’s ineluctable trick. Our memories of Magnus haven’t changed…but we have. We are different people, in different places, with different lives than we led 5 years ago. It’s healthy and it’s necessary to let the sadness and the “missing” go. It might seem wrong, but life is, in essence, the simple act of moving on. The most inescapable part of death is that the departed can’t move on with you. Ah, but let’s forget my gibberish philosophizing for a moment. It’s July 15th (well…16th, actually…damn you Alabama Power! 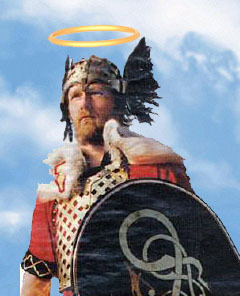 ), so we raise our glasses high on this, St. Magnus’s Day. Magnus may not be a part of our present, but he was an enormous part of our past. For that, we drink. Addendum: In my haste to publish, I egregiously neglected to mention the most important Magnus-related event that occurred since last St. Magnus Day: the birth of Magnus’s niece! Her entrance into the world marks the beginning of the next generation of Skullsplitters. It may be a cliche, but it’s also inarguably true…nothing files down the harsh edges of grief like a tangible reminder of life’s inexorable march. For those of us who still encounter moments of sadness when thinking about Magnus, the thought of his adorable niece eating, sleeping and pooping (three of Magnus’s primary skills) makes those bitter moments sweeter. She even kind of looks like him! At least inasmuch as all babies look just a bit like Magnus (the man was cherubic if nothing else). While this is obviously most important for Magnus’s sister, brother-in-law, and Grandma and Grandpa Skullsplitter, it was also one of the best baby announcements I’ve ever received. I didn’t know how much I wanted Magnus’s niece to be born until she was here. Addendum II: This year also saw the release of Mad Max: Fury Road…the most Magnusy movie ever made. The fact that I couldn’t see this movie in the theater with him is a goddamn crime. Posted in Magnus.Tagged Magnus, St. Magnus Day. Gramps McHops will raise a rare glass in his memory tonight !